Academy of Allergy, Asthma & Immunology. Start between the ages of 4 and 6 months. All foods should be pureed. As your baby can handle more textures, you can advance from purees. You may introduce water from a cup (not from a bottle). Babies can and should have small amounts of water with their solid food meals. This is usually only a few sips at a time which is why you should not use a bottle. There is no need to introduce juice to your baby. Start with any pureed food. I generally recommend avocados (for their healthy fat and ease of preparation), lentils (for their iron and protein) or a grain (also has some iron and protein when given in its whole grain form). You can make your own pureed wheat or oatmeal cereal. Click on those links to see how I make mine. Start with a tablespoon or 2. Feed your baby until he seems to lose interest. It may take a few attempts for your baby to learn how to use a spoon. If your baby uses a pacifier, you can use it to teach your baby to eat (that is a video of my first child learning to eat). After the first one or two attempts at feeding, you should no longer need to use the pacifier to help. Add one new food every 2-4 days. Remember your baby’s gut will be adapting to new compounds as new foods are introduced, and even though this is a good thing, your baby may need a little time to adjust. I recommend offering pureed foods in between milk feedings. A breakfast feeding may be at 8:30 or 9 am if your baby has milk at 7am and then again around 10 or 11. This way, the baby is not super hungry and frantic, looking for what he really wants (milk). But he also is not stuffed from a recent feeding. At first, your baby may appear to eat solids while drinking just as much milk as before. This is normal. 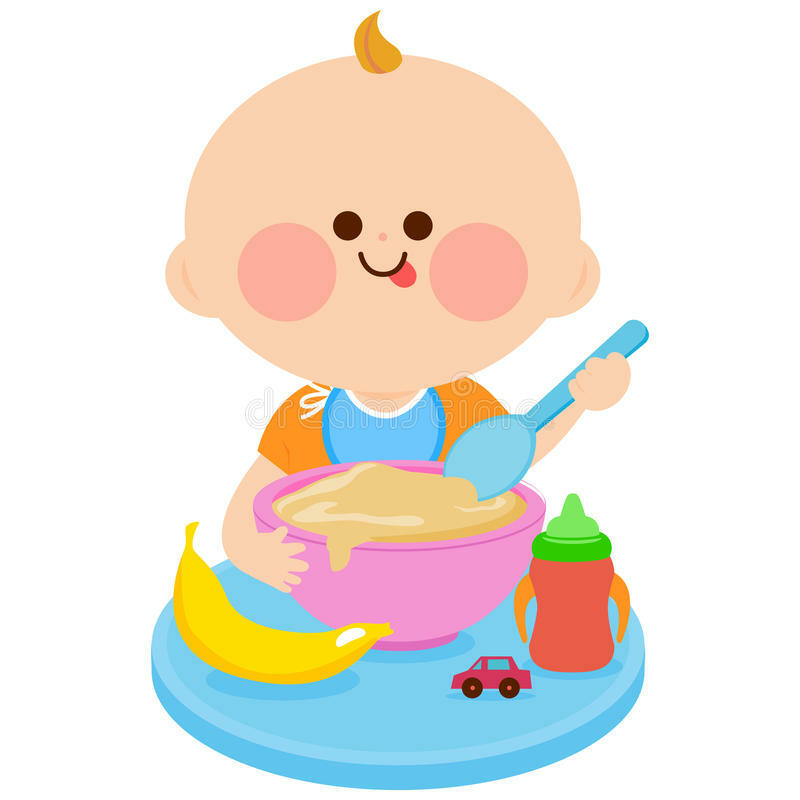 As your baby develops, he will eat more volumes of solids and advance to table foods. This will naturally bring down his milk intake. Once your baby tolerates some less allergenic foods, like grains and vegetables, you can introduce any food, including the highly allergenic foods, like eggs, nuts, dairy, soy and fish. Keep in mind that nuts pose a choking risk, but nut butters are generally ok. For some babies, however, they are very sticky. It may be helpful to offer them in small amounts on a grain, like a finger-food cereal or small pieces of toast or cracker. Some foods, like citrus and berries, may cause a little redness around the mouth or even hives. Reactions like this may not be true allergic reactions. However, if your child reacts to any food, discuss it with your health care provider before trying it again. Don’t forget to advance your baby’s schedule. Offer purees once or twice a day at first. By 9 months, most babies are eating 3 meals a day, including finger foods. The consistency of foods also should be advanced. With time, sometimes even just a few weeks, babies may be able to handle thicker textures and eventually table foods. Please make sure your baby is getting iron-rich foods. This is an essential nutrient, and after age 4-6 months, babies rely on solid foods or iron supplements to maintain adequate iron stores. Commercially prepared cereals offer a convenient source of iron. They may be nice to have around to mix with other foods if your baby is not eating naturally occurring sources of iron, like meats, legumes, or dark leafy greens. Remember healthy fats, especially in formula-fed babies. The only foods you must avoid are choking hazards (e.g. nuts, hard carrots, whole grapes, popcorn, hot dogs—everyone should avoid hot dogs, if you ask me). If your child has an adverse reaction to any food, discuss it with your health care provider before trying it again. If your child is at high risk for a peanut allergy (sibling with peanut allergy), talk with your pediatrician about it. In general, you can probably still introduce peanuts at home, but some situations may warrant a visit to the allergist prior to introduction. Try new foods at home, especially highly allergenic foods. You don’t want to be at a restaurant if your child has anadverse reaction!